The now famous Crockett spurs were created by Oscar Crockett who was born in Pecos, Texas in 1887. After his brother Arthur, Oscar wanted to also become a maker of Cowboy Spurs and after watching his brothers work he gained the skills and knowledge to manufacture his own. 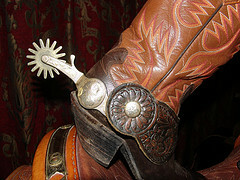 Oscar began to also produce other items such as belt buckles and buttons as part of the Crockett Bit and Spur company. The company also began to make aluminum spurs as well as the standard steel varieties due to customer request. Oscar Crockett was also a part of the Cowboy scene and often met at Rodoes and events to meet with the cowboys, take new orders and take on new customer made designs. He soon after moved to Kansas City where he opened his own shop selling spurs and other handmade blacksmiths items such as saddles, bit and tack. He continued to make western boot spurs and in 1940, in partnership with his uncle began to distribute a catalog of items for sale. After also acquiring the Shipley Spurs company he went from strength to strength. At one time he was making 177 styles of Spurs. Eventually, the Crockett Spurs company was purchased by Jim and James Renalde who continued to manufacture the Crockett lines until the company folder in 1980. Renalde Spurs are still very collectible. When buying Antique Crockett spurs, look for them to be stamped CROCKETT or C&G which was the stamp of Oscar and another unknown partner. After Oscars death and the company was acquired by Renalde the spurs were also stamped with a horseshoe CR symbol. The Crockett Bit and Spur company did mass produce these items but be on the lookout for items that were custom or hand made. His items were stocked in many states and therefore are common - but try to find items that are made before 1940.